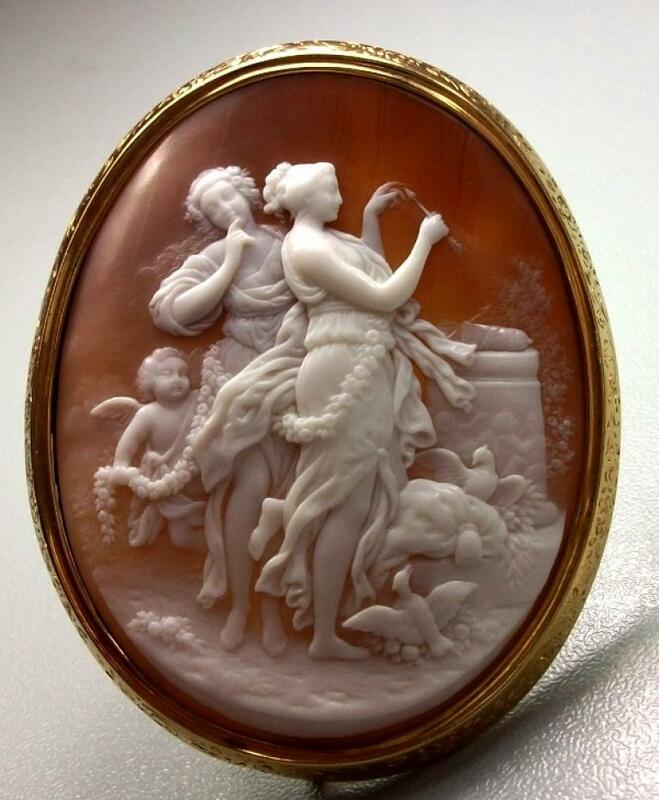 Material: Sardonyx shell, 15k gold tested. 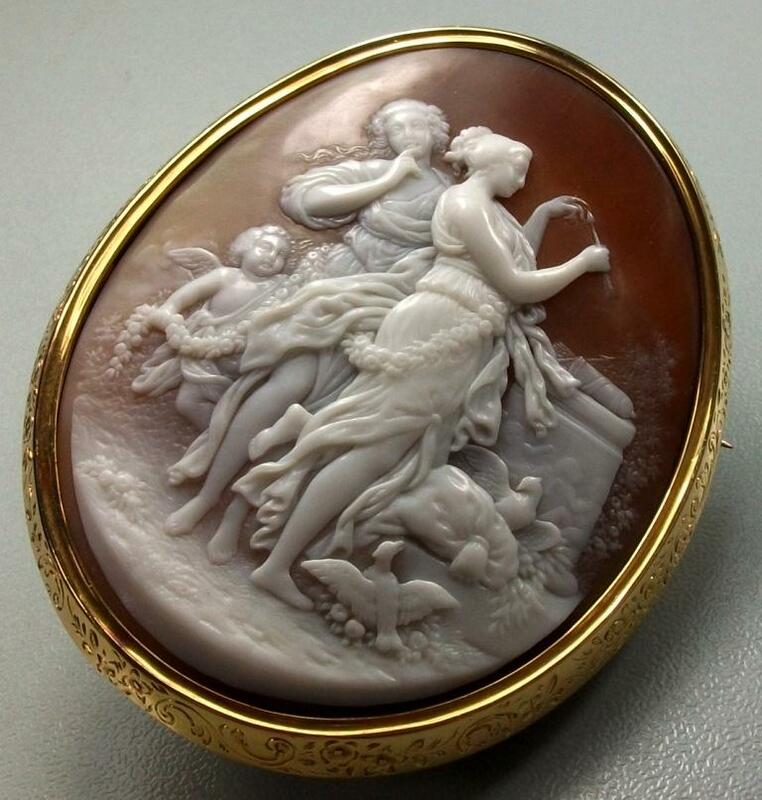 Size: 2 5/8" by 2 1/8" only cameo is 2 2/8" by 1 6/8". 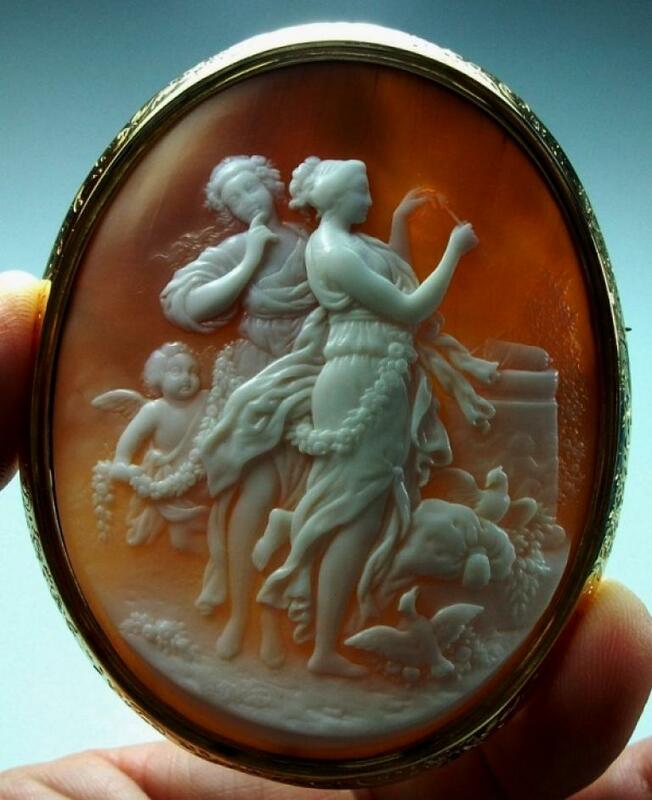 Conditions: Excellent, some slight natural shell lines, NOT STRESS ONES, one of them is very barely visible on the right side of cameo, the others are not visible by naked eye, (please always remind that pictures are enlarged) only visible when cameo is backlit. A few traces of soldering on the inside back frame. 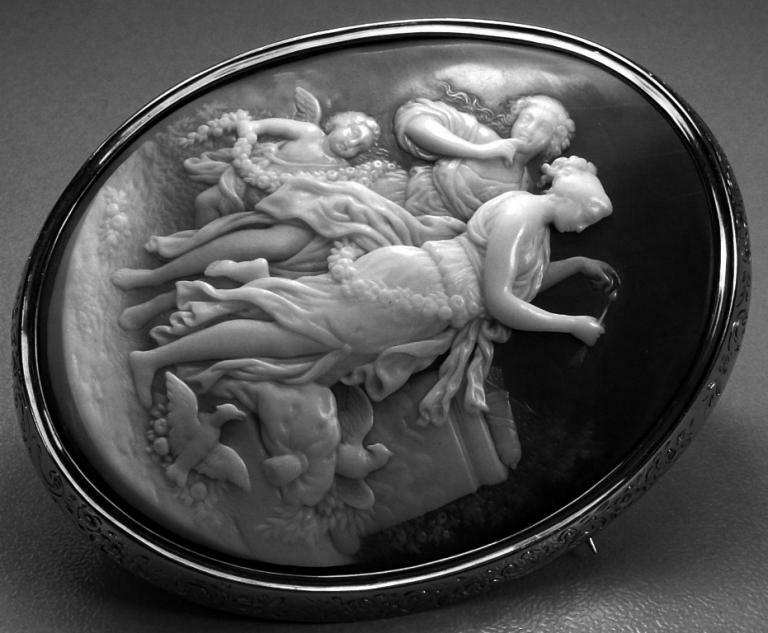 Highest Museum quality and large cameo depicting two Goddesses, Venus and Diana (Aphrodite and Artemis the Greek names). 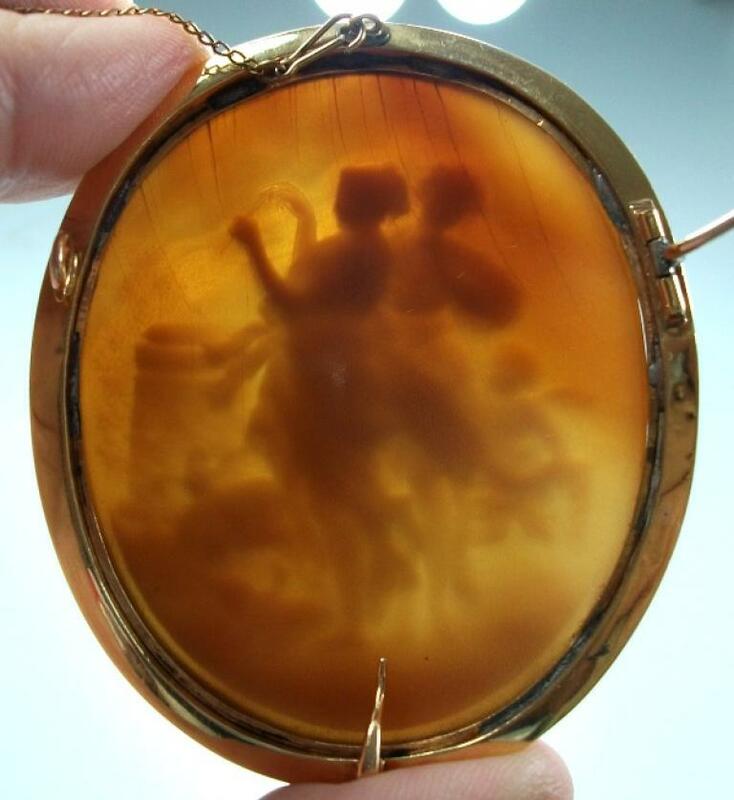 The pictures really don't give any justice to this more than wonderful cameo. 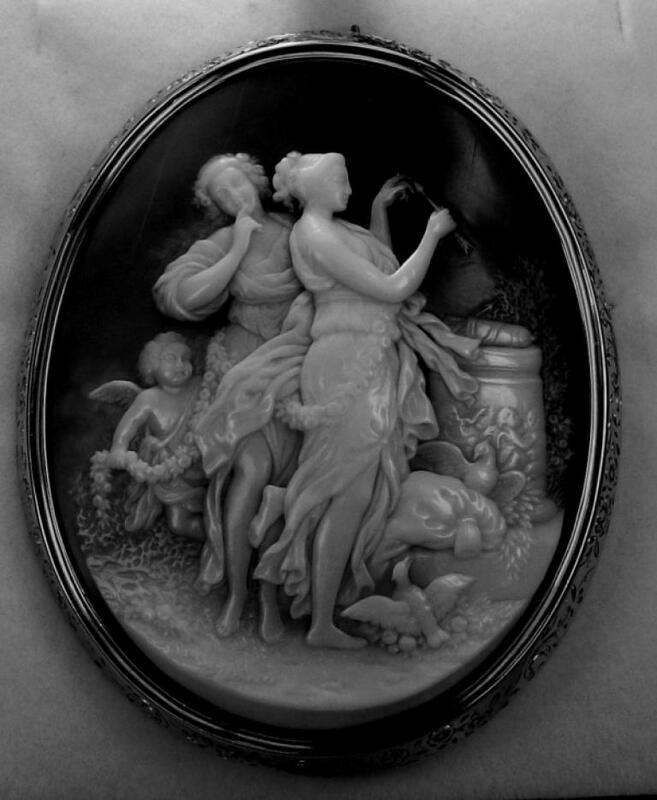 The carving is crisp and NOT worn at all even if from the pictures it could seem that Diana's face is a bit rubbed, IT IS NOT SO, this subject is hard to photograph so I have put some black and white pictures to show better the quality of the carving. The symbols of the two Goddesses are clearly shown, the quiver and the arrow for Diana and Cupid and the doves for Venus. This one is a rarest subject, never seen before now. 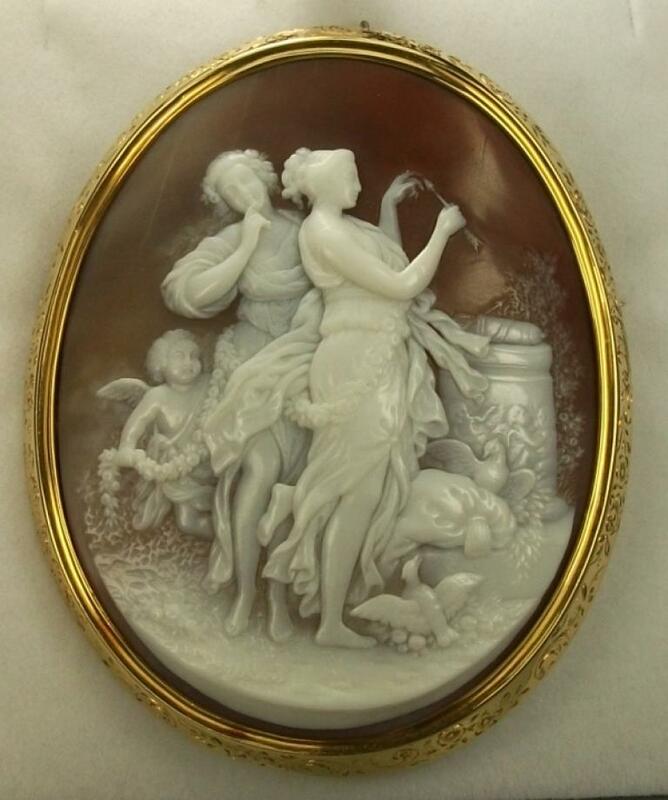 It is a bucolic scene where Diana is testing her arrow and Venus look at her while Cupid keeps a garland of flowers that ties the Goddesses both together. 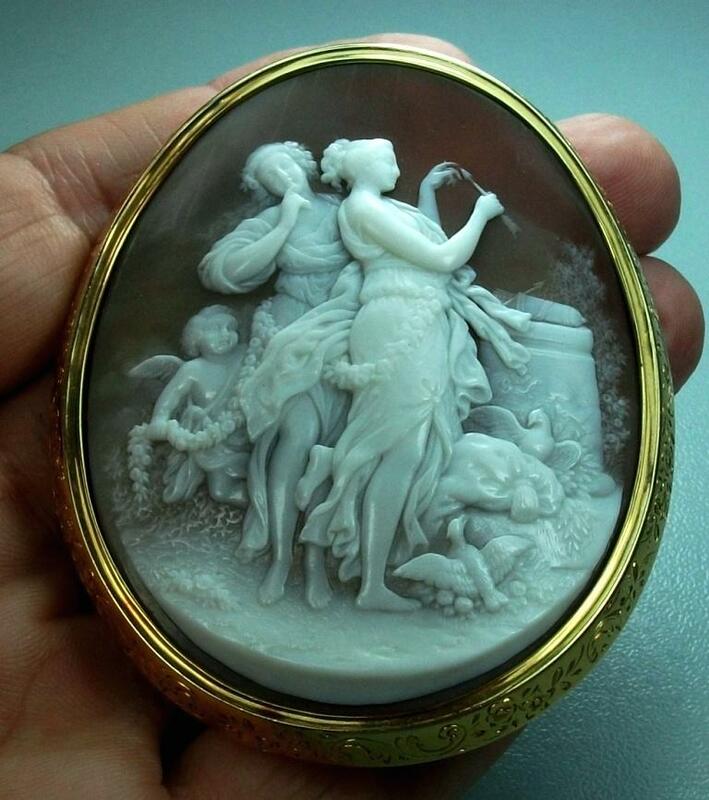 There are so many details in this cameo that is hard to see them all and each one is wonderfully carved. We can start from the two figures, Goddess Diana is testing her arrows touching its point with her finger and Venus looks at her, keeping a finger on her chin, and probably thinking if Diana is satisfied by the test result. You can see that Venus’ face just shows an interrogative expression, just amazing. The Goddesses clothes in pure Greek style are amazingly made, they are fluent and seem wavering around the Goddesses bodies. Venus has beautiful flowers on her hair. There is, on the left side of the scene, a ruin of a column and on its top there is Diana’s quiver, look at the base of the column, it is fully carved with Putti (Cherubs), fantastic. Close to Diana’s feet there is a sac probably used to put the hunted animals inside. The Cupid behind them happily keeps a garland of flowers and has a lovely happy expression. Two doves superbly carved participate to this wonderful scene. Masterly made foliage is on the background and close to the column. The proportions of the whole scene are simply fantastic, the bodies of the two Goddesses are flexuous, sinuous, elegant and sensual. 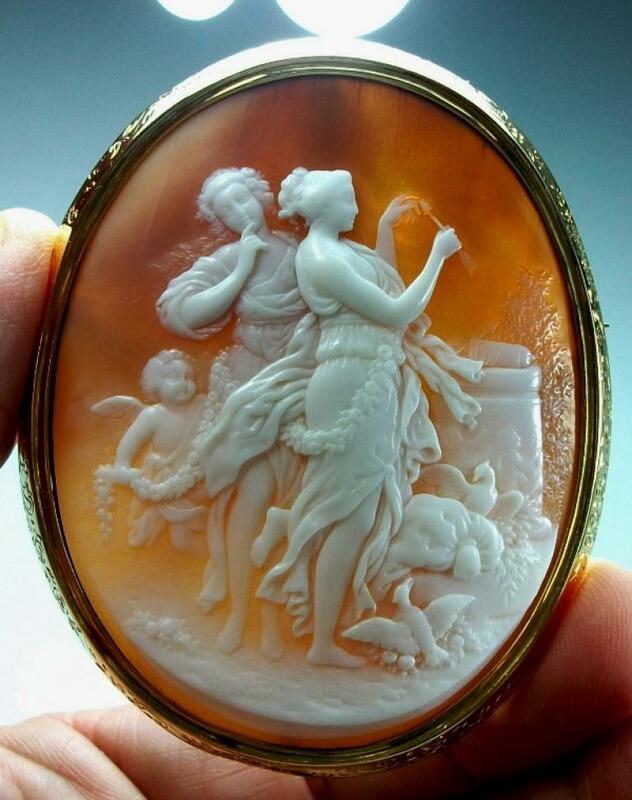 Everything in this cameo leaves me speechless, for the quality of the carving, for the elegance of the subject and for its rarity. A wonderful chiseled frame completes this artwork, flowers, scrolls and foliage are engraved on the gold frame. 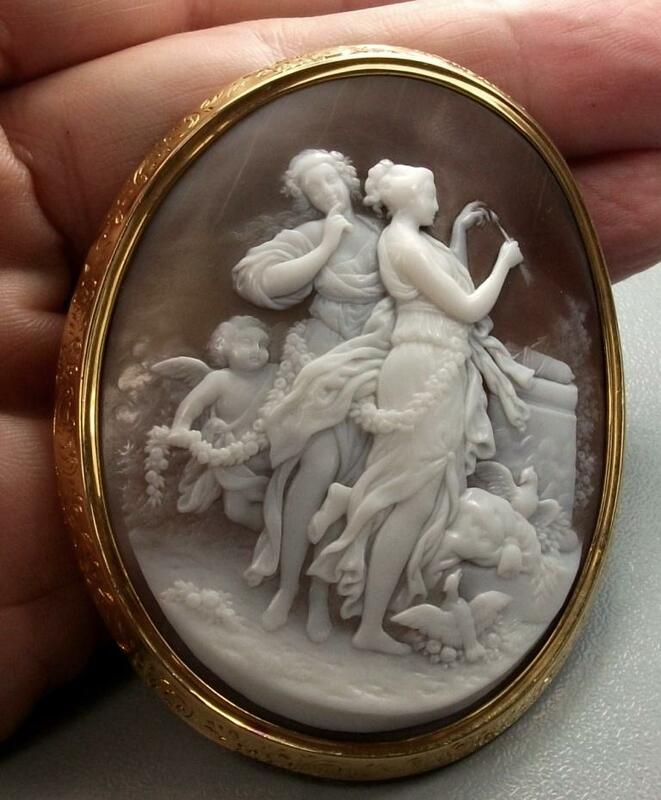 A finest and unique cameo, a real Museum Quality one. To not to be missed. Venus was a major Roman goddess principally associated with love, beauty and fertility, the equivalent of the Greek goddess Aphrodite. Venus was the consort of Vulcan. She was considered the ancestor of the Roman people by way of its legendary founder, Aeneas, and played a key role in many Roman religious festivals and myths. Venus had no childhood: in every image and each reference she is born adult, nubile, and infinitely desirable. 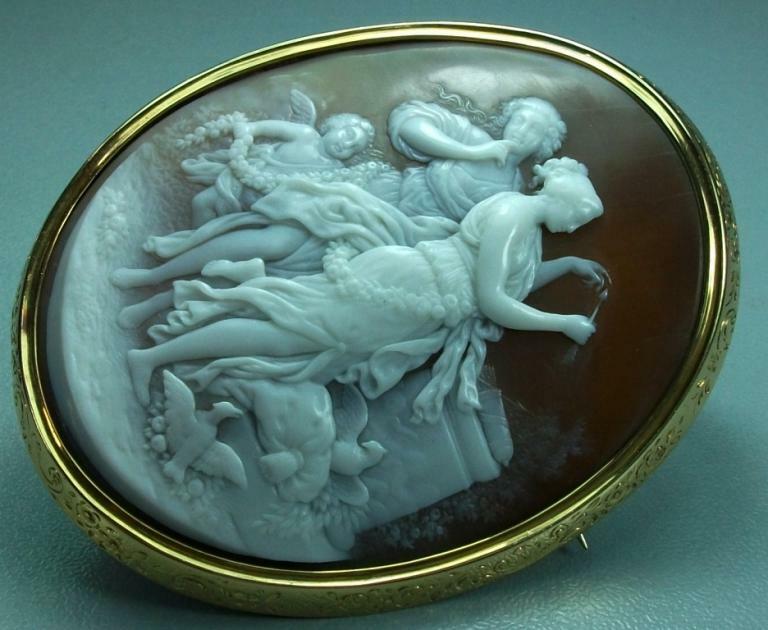 Venus, in many of the late anecdotal myths involving her, is characterized as vain, ill-tempered and easily offended. Though she is one of the few gods of the Greek Pantheon to be actually married, she is frequently unfaithful to her husband. Hephaestus is one of the most even-tempered of the Hellenic deities; in the narrative embedded in the Odyssey Venus seems to prefer Ares, the volatile god of war. She is one of a few characters who played a major part in the original cause of the Trojan War itself: not only did she offer Helen of Sparta to Paris, but the abduction was accomplished when Paris, seeing Helen for the first time, was inflamed with desire to have her—which is Venus' realm. Due to her immense beauty Zeus was frightened that she would be the cause of violence between the other gods. He married her off to Hephaestus, the dour, humourless god of smithing. Her unhappiness with her marriage caused Aphrodite to seek out companionship from others, most frequently Ares, but also Adonis. Cupid or Eros was son of Venus. 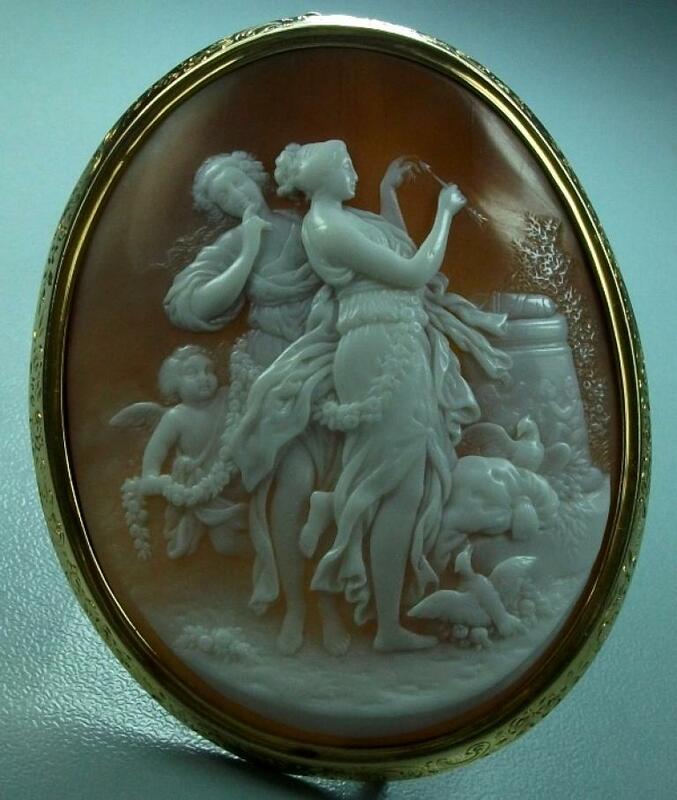 In Roman mythology, Diana was the goddess of the hunt, the moon and birthing, being associated with wild animals and woodland, and also of the moon and having the power to talk to and control animals. In literature she was the equivalent of the Greek goddess Artemis, the goddess of forests, hills, virginity/fertility, and the hunt and was often depicted as a huntress carrying a bow and arrows. Diana was worshipped in ancient Roman religion Along with her main attributes, Diana was an emblem of chastity Oak groves were especially sacred to her. 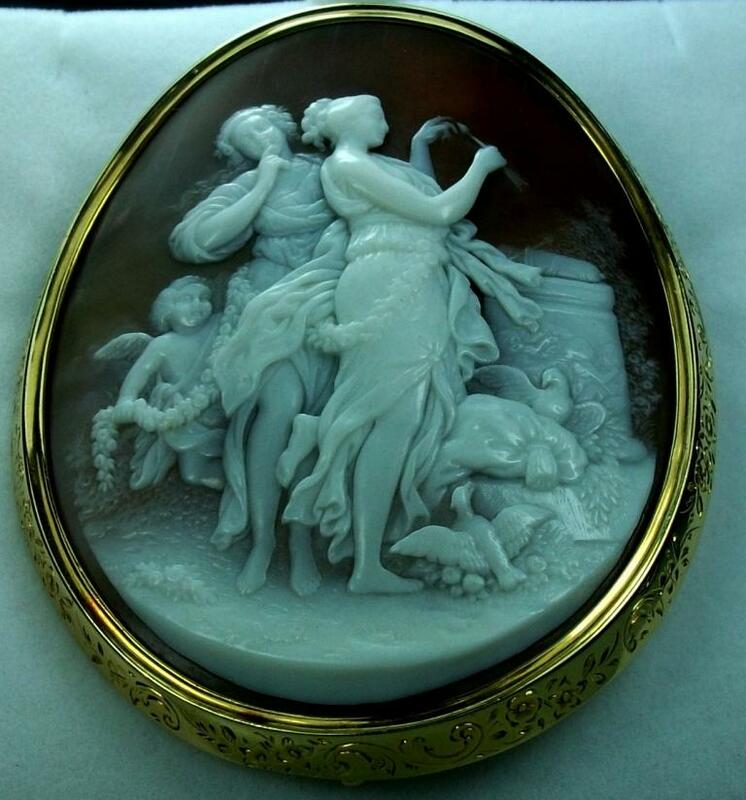 Diana was known to be the virgin goddess of childbirth and women. She was one of the three maiden goddesses, Diana, Minerva and Vesta, who swore never to marry. According to mythology, Diana was born with her twin brother Apollo on the island of Delos, daughter of Jupiter and Latona. 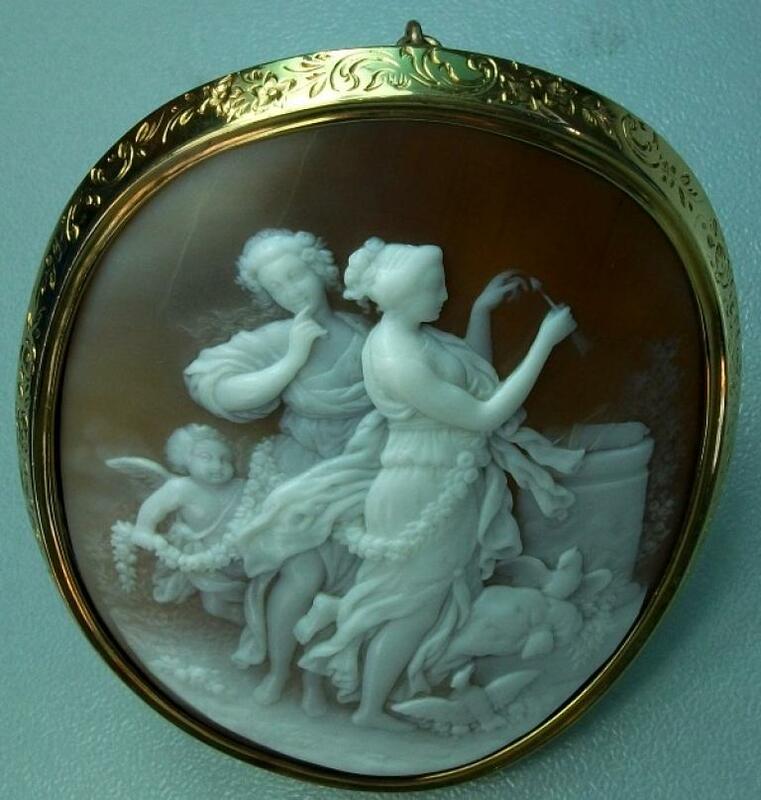 Diana made up a trinity with two other Roman deities: Egeria the water nymph, her servant and assistant midwife; and Virbius, the woodland god.